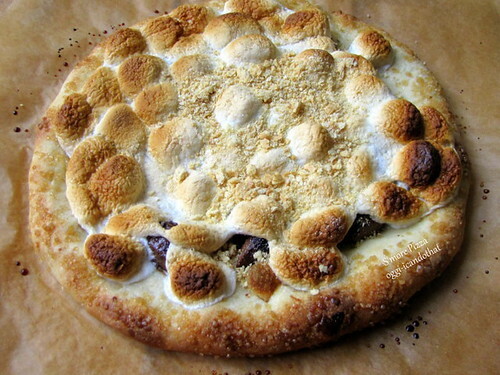 Food Friday: S'more Pizza ~ I Can Do That! After watching s'mores pizza being prepared here I just have to make it. 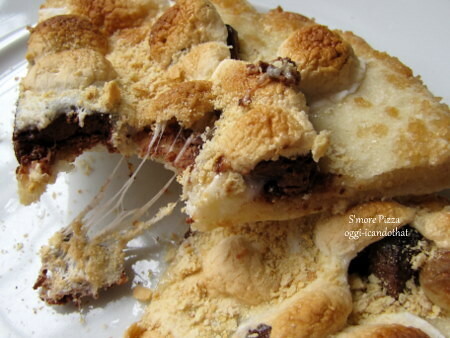 It's a salty, sweet, doubly crunchy, gooey, chocolaty, chewilicious dessert pizza. Try it, you'll love it! Place a pizza stone or quarry tiles on oven rack. Preheat oven to the highest setting. Shape pizza dough. Brush edges with olive oil and sprinkle with raw sugar. Place chocolate pieces evenly on the dough. Slide onto the baking stone and bake until edges are puffy, about 4 minutes. Pull out rack halfway and put marshmallows evenly on the pizza. Bake until marshmallows are puffy and golden brown all over. Remove from oven and transfer to a cutting board. Sprinkle top with crushed graham crackers. Cut with a sharp knife into wedges. Oh love the pizza...Happy FF! Wow! That looks good....and easy! That is new to me...but it looks good. Hi, I am working on a post about the best smores recipes out there. Can I use this in my post? I will of course link back to you. please let me know if its ok. email makethebestcrafts at gmail.